’seems on any given week there are a couple of UX conferences going down somewhere in the world. But in New Zealand we might get one or two in a good year. Couple that with our ‘cultural cringe’ factor, – a common belief that things which come from ‘overseas’ must be better – and you can see why Kiwi UX people working in NZ would be salivating over the speaker line ups and workshop offerings of conferences abroad. But … beware of false gods. While there’s no shortage of international speakers touring the circuit with their slide decks in tow, (most of which you can snaffle on online) Don’t overlook the talent and inspiring stories in our own back yard. …and that’s what UX Homegrown is about. So, get over your Tall Poppies (Another great Kiwi syndrome) and be part of what makes NZ a great place to be in UX. Now, on to those two free tickets. I’d like to give a student a chance, and a ‘switcher’ – who’s wanting to move out of their career into UX. 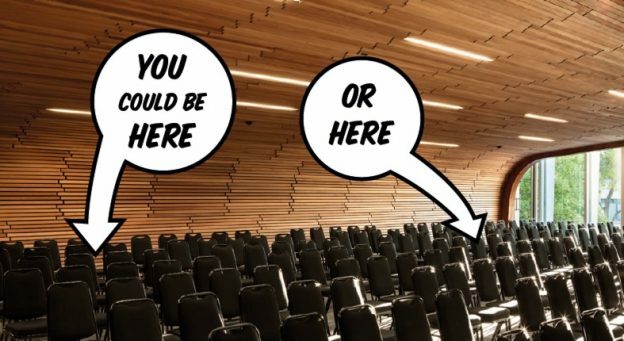 As you may have read, I stumbled into this field of work through a lucky break – someone gave me a chance in a time there were no UX conferences to be inspired by. And if you, or someone you know is UX curious, wanting to shift into the world of user centred design (from their current job) hit me here.